Ah, the indie film on Netflix instant. It’s always a hit or miss. This one, “happythankyoumoreplease,” is definitely a miss. I mean, just look at that post-modern title. One word. No spaces. Over it! The movie proved to be good background noise though. And Ted from How I Met Your Mother is in it, which is good to know he’s trying to branch out because I’ve never seen him in anything else. There’s a lost foster kid in the movie, who goes home with Josh Radnor’s character, who is a failed writer. (The failed writer bit is getting old in movies, don’t you think?) His friend with alopecia played by Malin Ackerman is hot but insecure, and her ex-boyfriend is a jerkwad. Other people have relationship dramz, the kid gets returned a la “Big Daddy” and the movie ends with Kate Mara badly lip-synching a bad song in a dark bar. The acting was totally fine. And the plot was ok too. But it didn’t really seem to pull at any heart strings or go much of anywhere besides the thought that sometimes life is a little hard. 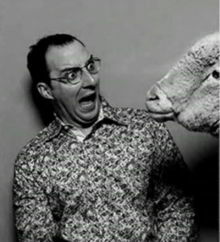 Buster from Arrested Development is in it also, but sadly not playing Buster. 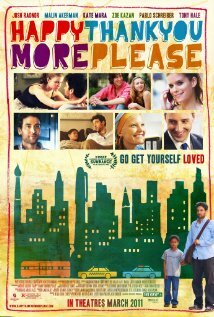 All in all, “happythankyoumoreplease” wasn’t the worst movie I’ve ever seen. Which is probably “Thankskilling.” Look it up.